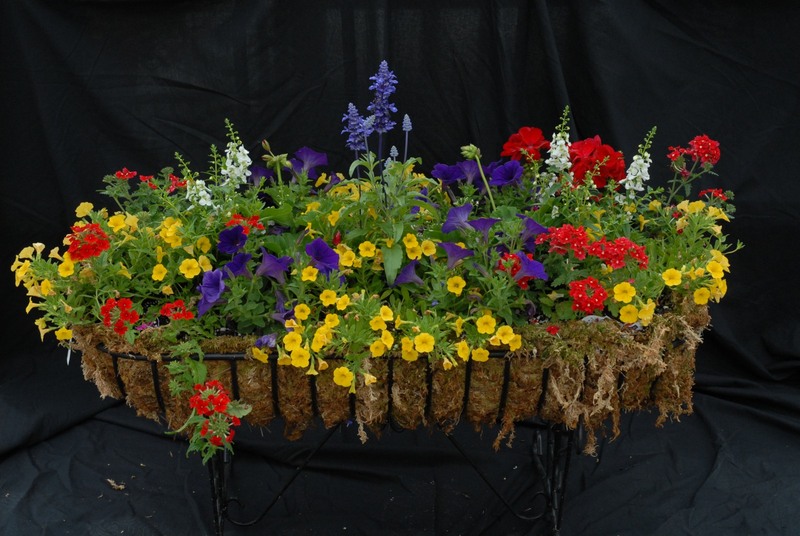 Container gardening, whether it be combinations of plants in pots, hanging baskets or window boxes, is one of the most popular trends in gardening today. And because these containers can be moved inside to protect them from spring cold spells, they are often the first “gardens” of the season. Deciding upon the pot is almost as challenging as choosing the plants! There are plenty of choices when it comes to design and material. There are lots of beautiful glazed containers available right now. The bright colors of these pots make flower combinations really fun! Whether you choose a plastic or clay pot, a twig basket or a galvanized tub, make sure the container you plan to use allows water to escape. Heavy downpours and over watering can be a disaster if the container does not have some type of drainage hole. Be sure to start with a clean container and fresh potting mix. This will help eliminate disease problems later on. Container gardens require frequent watering. Locate your containers where they are easy for you to water. Lets face it, containers that are too far away to be quickly watered, are more likely to be neglected. Using a soiless potting mix containing water holding crystals (or adding these crystals to regular soiless potting mix) is a good idea, especially for smaller containers. These products do not eliminate the need for hand watering but we’ve found they definitely help. Take note of the amount of sun exposure the container will receive and carefully choose the plants accordingly. You’ll want to combine plants that have similar light and water requirements. Incompatibility will only lead to plant suffering! We’re always drawn to the display of colorful flowers but including foliage plants in the mix creates the effect of a “living bouquet”. 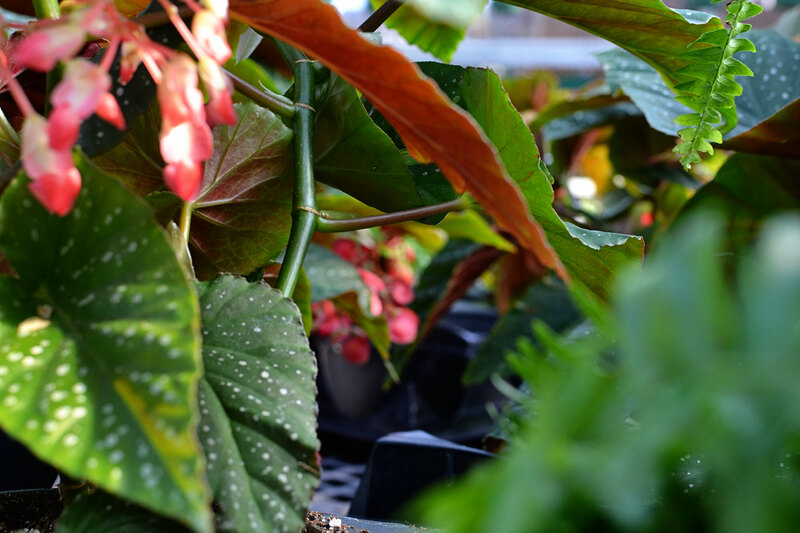 Variegated or colorful leaves can serve to complement flower colors, introduce texture and provide interest at times when flowering plants are not producing. You can spice up the mix by adding herbs, ornamental peppers or other edible plants. The edible peppers of the ornamental pepper ‘Chilly Chili’ are hot in color only! Many perennials are well behaved enough to get along peacefully with annuals. Ferns, hostas, and heucheras (coral bells) are nice perennial additions to shade containers. Remember to plant them in the garden in the fall so you can enjoy them again next season. Climbing plants meandering through an obelisk make a strong statement in large containers. Vines such as black-eyed susan , candy corn , mandevilla, or passion vine are all intriguing possibilities. Would you like to entice hummingbirds or butterflies with your patio pots? Try Including nectar-producing plants like lantana, penta or verbena. Always consider the growth habits of the plants you’ll use. You’ll want plenty of eye- pleasing variety. Look for upright and semi-upright growers as well as trailers and weavers. But, resist the temptation to cram too many plants in the pot. As the plants outgrow the container, keeping them watered can be a problem. Try to keep in mind the height of the plants you’ll be using and keep them in proportion to the container. Top-heaviness is not a desirable trait in a patio pot. As to a color scheme, there are plenty of opinions on that! Choose the colors that please you. If you want to match the front door of your house, go for it! If a riot of color is more your style, then do it. Experimenting with new plants or combining old favorites in new ways is what makes container gardening so much fun. The possibilities are limitless. There’s just no match for the concentrated flower power that a well-designed container garden can supply!